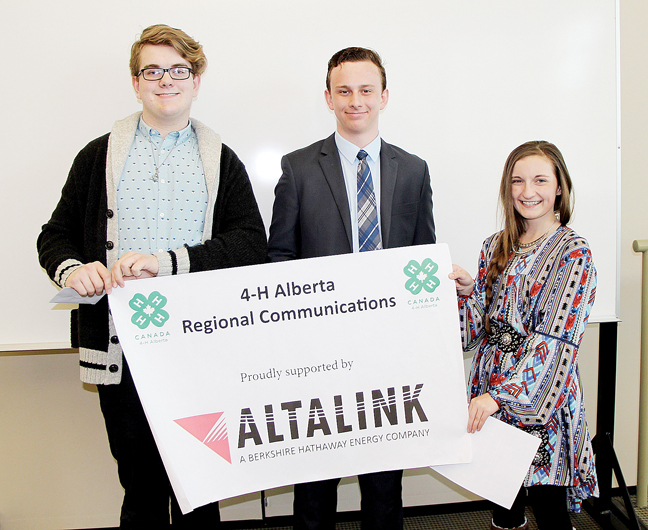 Retlaw Prairie 4-H members talked their way to the top at the 4-H Regional Communications Competition at Lethbridge College. First-year junior member, Ella Odland, placed second in her category with her presentation entitled “Blades of Glory.” Ella showed the difference between figure, hockey and speed skates. Vane Ferguson snagged second place in the Intermediate category with his presentation called “Two Wraps and a Hooey.” His presentation was on tie-down roping. Vane has been competing in tie-down roping in the high school rodeo circuit and he was able to do a fabulous presentation on how it’s done. Jessie Ferguson placed first in senior presentations with “Mind Your Melon.” Jessie discussed the importance of wearing a helmet while horseback riding and showed the different types of helmets that are available to wear while riding. Jessie will be competing in the Senior 4-H Provincial Competition with her presentation, April 6, in Wetaskiwin. Chelsey Mills also competed in the Regional Communications Competition with her public speech, “What Should I Be Doing.” Chelsey’s speech gave the early warning signs of Alzheimer’s and told about how early detection is key, as there are new treatments available that may slow down the disease. Chelsey competed against 19 other very strong speakers, and although she did not place in the top three, she still did a fantastic job and placed right in the middle of the pack. Congratulations to these members. You really made our club and community very proud.